British Airways and American Airlines launched new Transatlantic premium class flights today (the American offer will come after this on the blog) More lucrative than last summer's offer that maxed out at 100,000 bonus after four flights (20,000 in Prem. Econ.) Then again last summer BA Avios hadn't been devalued yet so perhaps this larger bonus is to appease those who may have become disenchanted with the changes that came in on April 28. Over all this offer will award up to 115,000 bonus Avios for First and Business Class or 30,000 bonus Avios for Premium Economy and Full Fare Economy. For us Canadians your direct non stop options are BA out of Vancouver, Calgary, Toronto or Montreal or Finnair out of Toronto. 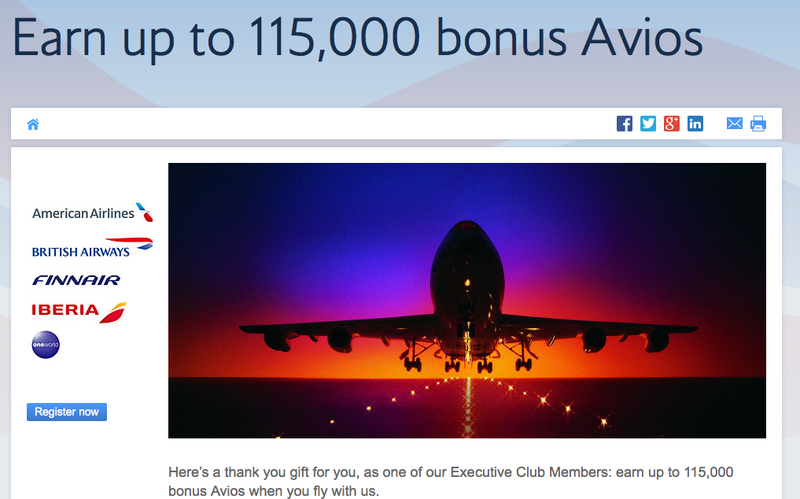 You can always earn the bonus if you connect via the U.S. with any of the airlines listed below. Can't make use of this offer? Be sure to visit our Executive Club Bonus Avios page for many more bonus opportunities!